I drink a lot of tea. I love all different blends, such as green tea, black tea, chai tea, etc. Let’s not even get started on how much I love iced tea. I’m not up there with Uncle Si, where I’m carrying it around everywhere, but you never know lol! I no longer drink coffee, due to the effect it has on my incredibly sensitive stomach. Due to this, I have found alternatives that I love just as much! When I started pursuing a healthier, chemical-free lifestyle, I found out that not all tea is created equal. Sadly most of the popular tea brands, like Lipton and Celestial Seasonings, are chalk-full of harmful chemicals. The leaves are sprayed with pesticides and you are steeping all that in steaming hot water and sucking it down. In fact some are laden with harmful carcinogen’s (cancer-causing chemicals), like caramel color. As if that isn’t bad enough, many contain additives, like artificial flavoring, natural flavors and GMO’s. Now lets talk about the tea bags or sachets. Many of these bags are made with plastic. Yes, that’s right PLASTIC. . .again being steeped in boiling hot water. Even the paper bags are treated with harmful chemicals. Call me a Purist, but why do we need all that in our tea?! The fact of the matter is we don’t. Once I learned this, I went on the hunt for an organic tea and that is how I found Numi Organic Tea. I like their Gunpowder Green in the morning. When I am having a sweet craving, usually in the evening, I go for their Chocolate Rooibos or Rooibos Chai. If you want a coffee replacement, the Purah varieties are great. I really like those on the days I am dragging and need some extra caffeine. 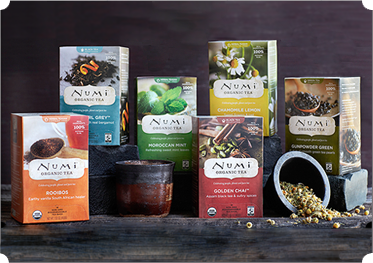 All of Numi’s teas are certified Organic, NON-GMO Project verified and Fair Trade Certified. All their tea is 100% pure ingredients and free of pesticides. This means no harmful additives, no chemicals, and NO natural flavors. They recently have added savory teas to their collection (think Carrot Curry, Broccoli Cilantro, etc). Another new addition is their Turmeric Tea collection. Remember how I mentioned that many tea bags have plastic in them. Not Numi. . . theirs are “natural, biodegradable filter-paper tea bags rather than nylon or GMO-origin tea sachets”. Tea is rich in polyphenols, tannin, and flavonols, fluoride, and vitamin C, P, K, and B. Drinking tea has numerous health benefits. According to the Numi Organics website, “Recent studies show that polyphenols found in green tea appear in greater concentrations in white tea, helping to destroy bacteria and other organisms that cause disease. (Pace University’s Dyson College of Arts & Sciences)”. Drinking tea can also help prevent tooth decay and bad breath. Some studies have shown that green tea can help burn calories. . . I think I may start drinking two cups a day now! Remember the Turmeric collection I mentioned above? Well according to WebMD, turmeric can be used to help with “arthritis, heartburn (dyspepsia), stomach pain, diarrhea, intestinal gas, stomach bloating, loss of appetite, jaundice, liver problems and gallbladder disorders. It is also used for headaches, bronchitis, colds, lung infections, fibromyalgia, leprosy, fever, menstrual problems, and cancer. Other uses include depression, Alzheimer’s disease, water retention, worms, and kidney problems.” Turmeric tea is great for helping with inflammation! I have plans to try this new variety out soon! Another great organic tea brand is Traditional Medicinals tea. When my family is starting to feel under the weather, I like to use these teas to get everyone back to normal. They have a Throat Coat blend that is great for scratchy throats. Another variety they produce is called Echinacea Plus and it is an immune boosting tea! Traditional Medicinals is USDA certified Organic as well as Non-GMO project verified. Numi Organic has a great variety of tea products. I have yet to try one that I have not loved. Not only do they carry tea bags, but you can also get loose leaf tea, flowering teas, different tea making accessories, and they now offer ICED TEA!! You can only imagine how excited I was to find this out! The Cons are that most stores carry a limited variety and the prices can run a bit higher. The only place I found so far to purchase the new iced tea varieties is through Numi’s website. However, they do offer 10% off your first purchase! Across the board on Vitacost and Amazon, Numi Organic Tea received 4 1/2 to 5 Stars. FoodBabe is also a big fan of Numi Organic tea! You know if Food Babe approves it, it has to be not only good, but safe! You can buy straight from the Numi Organic’s website and get a 10% coupon when you sign up for their newsletter. You can also purchase on Vitacost.com (Click here to get a $10 off coupon) or Amazon.com! 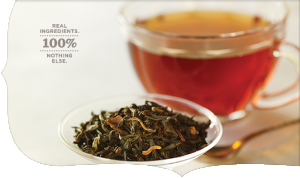 Numi Organic Tea provides a great alternative to nasty additive and chemical-filled conventional teas. Numi has a good variety of products that even the most discriminating tea drinker can appreciate. If you’re thinking about throwing your Lipton or Celestial Seasonings in the garbage, make sure to go stock up on Numi and taste the difference of organic, chemical-free goodness!